ThermalTake presents the Transporter Carry Bag, which is basically a heavy-duty carry bag for your full-tower PC plus accessories. The polyester fabric is rated to hold up to 100kg (220lb) and is rain, dust and snow resistant. Pricing and availability is unknown. 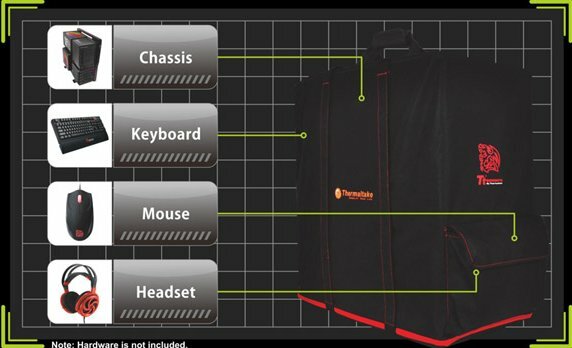 Thermaltake, being the industry pioneer brand in thermal solutions, carrying the corporate vision of “building Thermaltake Technology into a cultural brand for the enjoyment of entertainment, e-Sports, technology, and lifestyle” and continues to drive toward the corporate mission of “delivering the perfect user experience” in varies PC market segment, debuts the Transporter Carry Bag which offers LAN game party fanatics a burly chassis carry bag that maximizing portability for all types of full-tower and PC accessories with exclusive protection in various weather conditions. The Thermaltake Transporter Carry Bag is a dynamic chassis carry bag for LAN party fanatics which support all type of full-towers when on the move. The all black design with the special material offers the flexibility and maneuverability to store fanatics’ rigs or even to store itself away. With an unify designed strap and hand holder permit the Transporter to grasp up to 100 kilogram in weight without any hassles. The special material of polyester with polyurethane provide the resistance while fanatics exposed their important rigs in all kind of rough weather conditions, like rain, snow and dust, grant an extra protection while traveling. The Thermaltake Transporter Carry Bag made out with the special polyester material with the dimension of 600mm x 300mm x 600mm (L*W*H) has utilized one 300mm x 30mm x 600mm (L*W*H) large pocket and a small pocket of 300mm x 30mm x 230mm (L*W*H) on either side of the carrying bag which has the flexibility to lug all type of full-towers with its accessories like keyboard, mouse, headset, cables and much more.